"What does it mean that black men are being shot in the back?" In the time of Ferguson, Baltimore, and Charleston, the poet Claudia Rankine has been the lyric teller of our deepest hurt. Her new book, Citizen: An American Lyric, was a best-seller and something of a lifeline this year, mapping America’s racial traumas — from the Katrina travesty (2005) to the death of Trayvon Martin (2012) and the now-and-then travails of Serena Williams. Rankine says that American life is made of these moments when race gets us “by the throat.” Only some are nationally noted tragedies. The rest: millions of episodes between friends and loved ones, errors of human interaction, when “citizens” of different races trip up, and damage each other, typically without realizing it. A friend tells you he has seen a photograph of you on the Internet and he wants to know why you look so angry. You and the photographer chose the photograph he refers to because you both decided it looked the most relaxed. Do you look angry? You wouldn’t have said so. Obviously this unsmiling image of you makes him uncomfortable, and he needs you to account for that. If you were smiling, what would that tell him about your composure in his imagination? 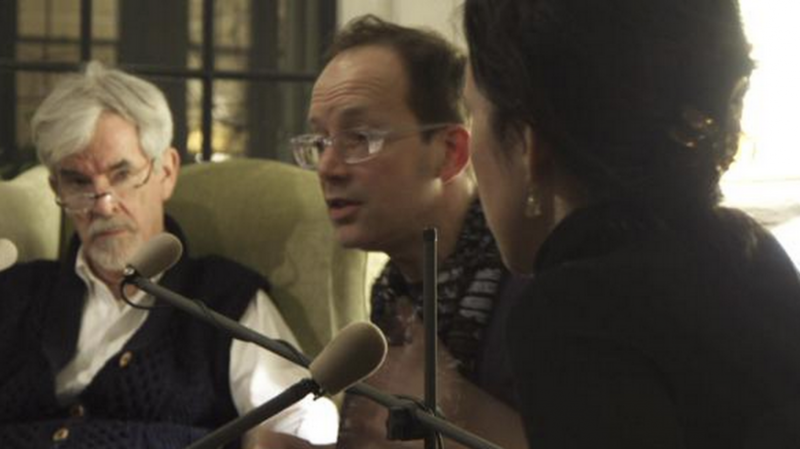 We had gathered a poets’ panel in Chris Lydon’s living room led by Harvard’s Stephen Burt earlier this year, and the conversation about Citizen took over. Burt and company were ready to compare Rankine’s poetry to The Wasteland or Howl, and they marveled over Citizen’s Whitmanian multitudes: elegiac verse, poetic prose that reads as diary or essay, video scripts, and diptychs of words and art. I didn’t want to create false hope… I thought, “Gosh, this problem has been around since the market—since black bodies were part of the market. When they were objects. When they were considered property.” And that equation between whiteness and the black body as property of whiteness is the equation we can’t get out of… I wanted to end [Citizen] with Turner because people always say, “Well, I didn’t know. It wasn’t my intention. 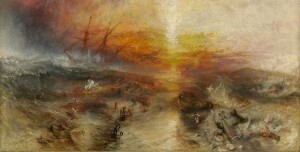 I wish I had known more about this…” But Turner knew better in the 1800s. He knew better. And this is 2015. So, there it was. The end. Rankine told the ICA crowd that she has always loved Turner. He shows her that not everyone is stuck all of the time. The micro- space where people live and create is where we fail each other every day, but it’s also the place where sometimes we surpass ourselves. 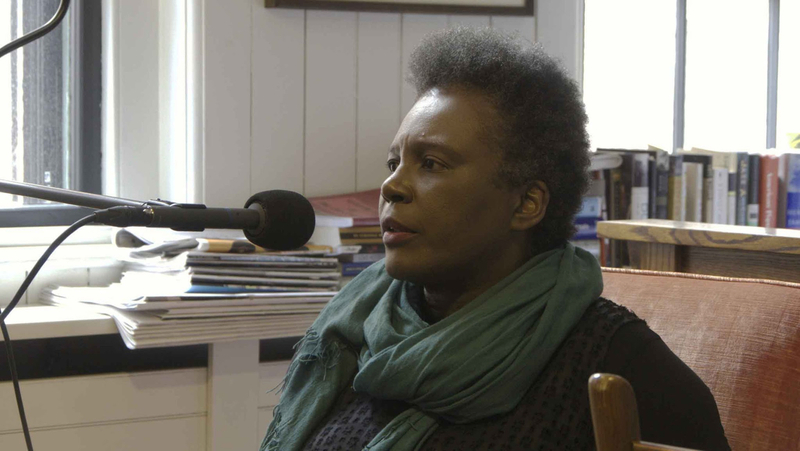 Can any of us listen to Claudia Rankine without asking: How have I failed this year? How have you? So tell us on Facebook: When does race have you by the throat? And, just what does it feel like in your skin? Photograph by Don Usner/Lannan Foundation. After a long interview, Claudia Rankine agreed to field our sometime questionnaire for poets and writers, which we’re bringing back in 2015. See the other questionnaires here. As a poet, who’s in the conversation with you, living or dead? Toni Morrison, of course: “This is not a story to pass on” — the last line of Beloved. J. M. Coetzee: I love the way he sees blacks, whites, everyone, as failing, failed, anxious, self-interested individuals, which we all are. Fred Moten, The Feel Trio. Louise Glück, who taught me at Williams, whose ability to interrogate a moment has stayed with me. Claire Denis, the filmmaker. Chris Marker. Who do you think of as doing the work of your spirit in a different medium? Michelle Alexander’s The New Jim Crow is a really important book to me right now, in terms of “the school-to-prison pipeline.” Many of the visual artists in Citizen, people like Glenn Ligon and Wangechi Mutu. Steve McQueen — did you see that film he did, called Hunger? It’s the most beautiful film, on a hunger strike in Ireland. One of the things I love about him, the sense that one can interrogate a social condition through beauty. Beauty doesn’t just fall by the wayside. Because the eye is always looking, it’s always seeking, you know? When you walk down the street, who do people see? That’s odd. I don’t know. I’m looking myself. I’m always looking. I love being outside. I love overhearing conversations. Maybe what they see is somebody who’s watching. 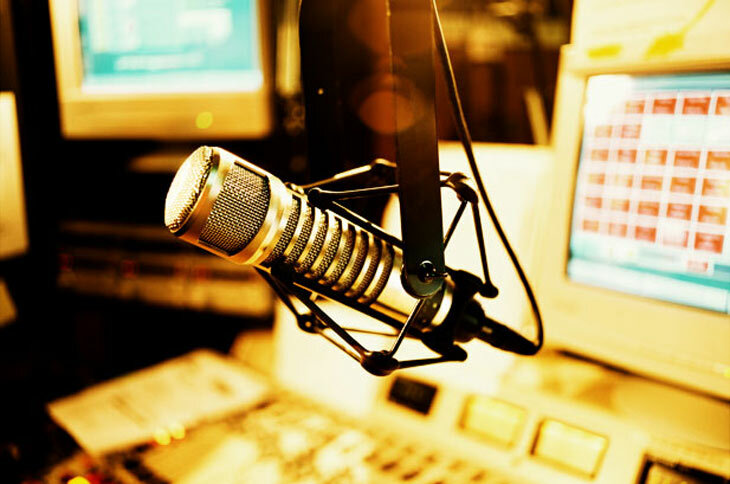 What is the talent that you’d most love to have that you don’t have (yet)? What’s the keynote of your personality, as a poet? I think I’m patient on the page. I will stay with something for as long as takes for me to feel that whatever I wish to communicate is being communicated. And if that’s the whole book on one thing, that’s OK.
Who’s your favorite character in fiction? In J. M. Coetzee’s Waiting for the Barbarians, the plot in a sentence is that the guy who’s in charge of the village. He has a black housekeeper who he falls in love with. And at a certain point of the story he says to her, “You can leave, or you can stay with me.” And he’s very torn up about what she’s going to do. I love that character, because you know she’s going to leave — and she does leave. She’s always been a favorite character of mine. Man or woman, I love anyone who will laugh — at anything. At things I say, at things they say, at things they see, at things that aren’t even funny. I was going to ask you: what’s your favorite quality in a woman? I love women who don’t care, who are not being controlled by external ideas about what it means to be a woman. And you know those women when you see them — they just don’t care. It’s sort of Sula, in Toni Morrison: women who make their own terms. What are your desert-island discs? I would take Miles Davis, Kind of Blue. I know it’s traditional, but I would take it. I would take Adele, 21. I love Adele; I love that voice. The third one would be the hardest one to choose: I guess I would take a radio. There’s a quote from Romare Bearden, the collagist. He said, “There are all kinds of people, and they will help you if you let them.” As somebody who collaborates a lot, I take that to heart, and I certainly would hope that other people would see me as one of those people who would help them, if they would let me. What’s your city for all time? New York. I know I live in L.A., but… New York. Old, I’d like to die old — and laughing. writer and poet of Citizen and Don't Let Me Be Lonely. Play the video above while you read these lines about the suspicion that adheres to black males and the guilt that fills train cars. This poem joins Rankine's various styles. It's a scene from navigating race in daily life, but almost every character seems a composite. And, it's a verse poem that reads almost as prose. Browse the website of the Academy of American Poets for more excerpts from Citizen: An American Lyric. When we march under one banner for different causes, when we gather many different cases under the title “Black Lives Matter,” for example, simplification is needed. Political movements require basic statements like these in order to gather disparate groups into one powerful bloc. But lyric poetry tends not to work like that. It chases particulars. Its symbols are not public ones. It aspires to compress without simplifying. Citizen dares to reject those tenets. It suggests that because white culture is prevailingly reductionist, seeing a black man and feeling fear, viewing blackness as one monolithic construct (Rankine refers to “the ‘all black people look the same’ moment”), the poetry that responds should likewise be unafraid to adopt those modes, to link and equate the deaths of different black men without regard to respective circumstances. Clark uses taxidermy to create her sculptures. 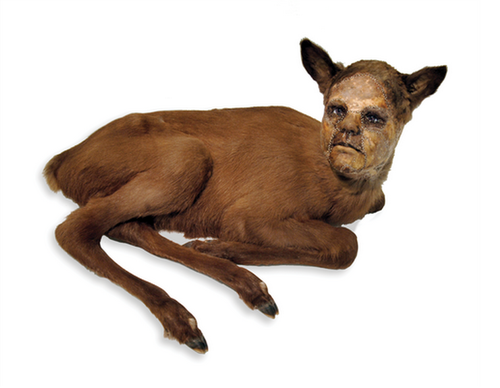 In the particular piece I used in Citizen, she attached the black girl’s face on this deer-like body—it says it’s an infant caribou in the caption—and I was transfixed by the memory that my historical body on this continent began as property no different from an animal. It was a thing hunted and the hunting continues on a certain level. So when someone says, “I didn’t know black women could get cancer,” as was said of me, I see that I am not being seen as human, and that is fascinating to me, even as it is hurtful in a more superficial way, since my stomach hurts more from the chemo—or is it the diagnosis?